The CFE Fund’s national Bank On platform supports local banking access efforts. Registration is now open for the CFE Fund’s 2019 Bank On National Conference on May 29th in Washington, D.C.
Every two years, the Bank On National Conference brings together key stakeholders from multiple sectors across the country: local Bank On coalition program leads and their community partners, city administrators, financial institutions large and small, federal banking regulators, national nonprofit organizations, philanthropic partners, consumer advocates, researchers, and more. Conference topics will include innovations in safe and affordable financial products, strategies for banking access connectivity and integrating banking access into community programs, and measuring banking access success. This press release announces that 28 banks and credit unions with over 21,300 branches now offer accounts meeting Bank On National Account Standards, newly updated for 2019-2020. Low-cost, low-fee, no-overdraft financial products that meet these national Standards are now already available across all 50 states and the District of Columbia at banks and credit unions that range in size from as many as 2 branches to as few as 5,500 branches. Bank On National Account Standards provide local programs with a benchmark for safe, affordable account partnerships with mainstream financial institutions. Bank On coalitions and accounts meeting Bank On Standards are available across the country. Certified accounts are available now in over 21,600 branches, with more on the way! 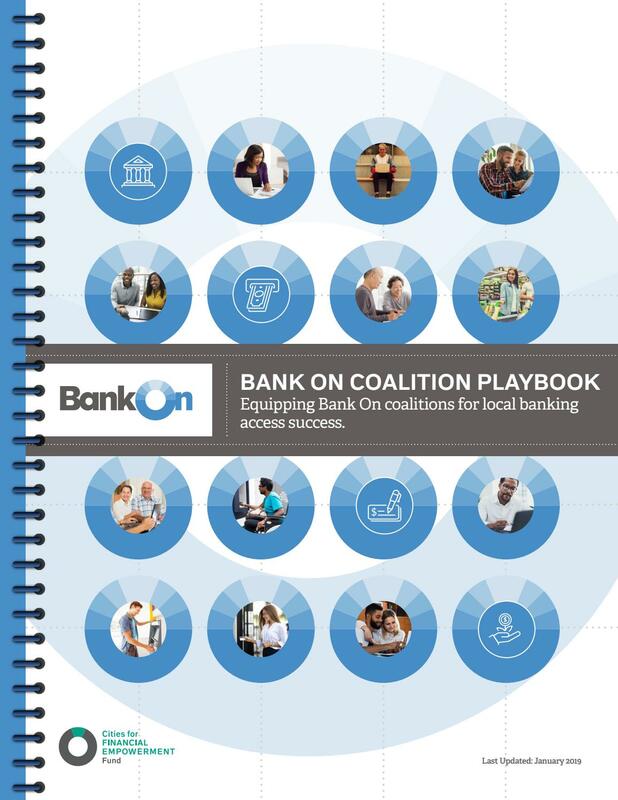 Our #BankOn Coalition Playbook is the go-to resource for banking access integration strategies & tips on navigating fin institution partnerships. Read now! Tools and resources to equip Bank On coalitions for local banking access success.